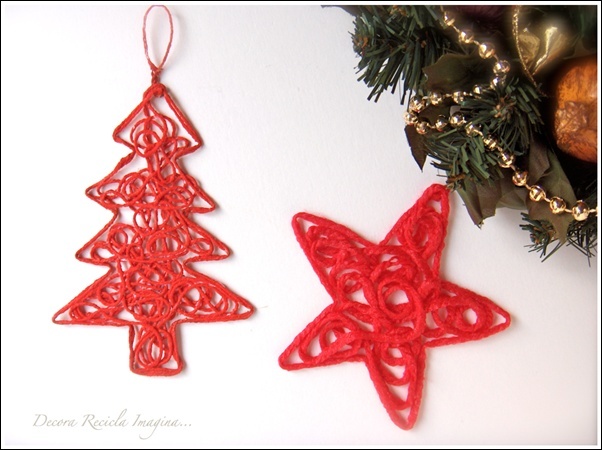 To make these ornaments you will require some red colored yarn, white glue, toothpicks, a polystyrene tray, a bowl and water. First mix some water and glue in equal quantities in a bowl. Soak the yarn in it keeping one end unsoaked so that it is easy to handle. Then draw a star shape on the back of a polystyrene tray or use a paper template. Then poke toothpicks in the tray at the the outer and inner corners of the star shape. Tie the unsoaked end of the yarn to a toothpick and finish the star shape with yarn by passing it through the toothpicks in a way that the yarn will come at the outside of outer corners’ toothpicks and inside of the inner corners’ toothpicks. Remove the template if placed. Then make circular patterns filling the star. Let it dry and voila! Your ornaments are ready to decorate your Christmas tree.